The Fulton VSRT 250 (250 HP) is a revolutionary vertical spiral rib tubeless steam boiler designed to accommodate a vast range of requirements. 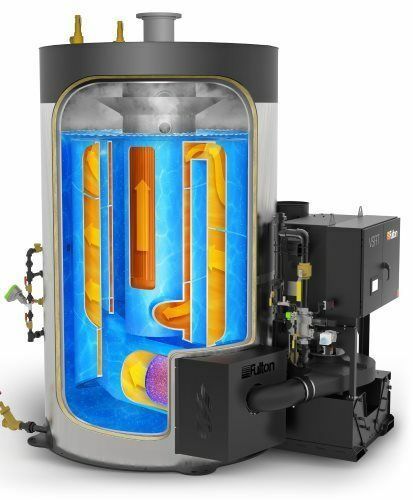 Fulton invented the vertical tubeless boiler design back in 1949 and has continued to push the envelope to redefine the status quo for industrial steam boilers. Since its inception, no other manufacturer has been successful at improving on Fulton's original design. Today, Fulton elevates the status quo again with the new Fulton VSRT 250. 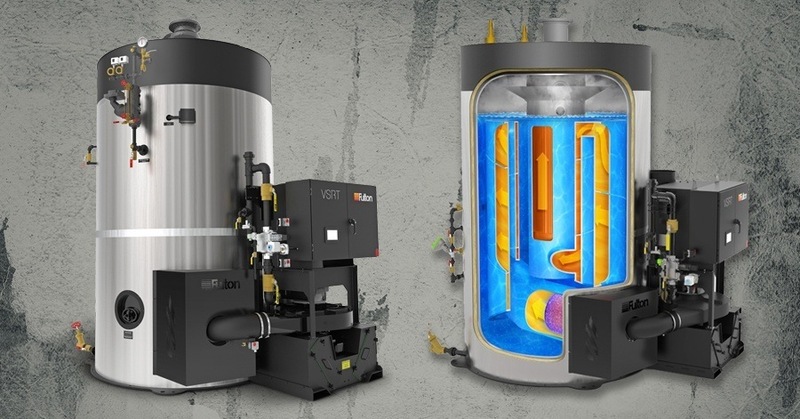 The VSRT 250 is the world's first refractory-free, fully-wetted tubeless vertical boiler. It features Fulton's Pure Optimized technology and is engineered to provide a reliable, lasting source of clean steam for a vast range of applications. 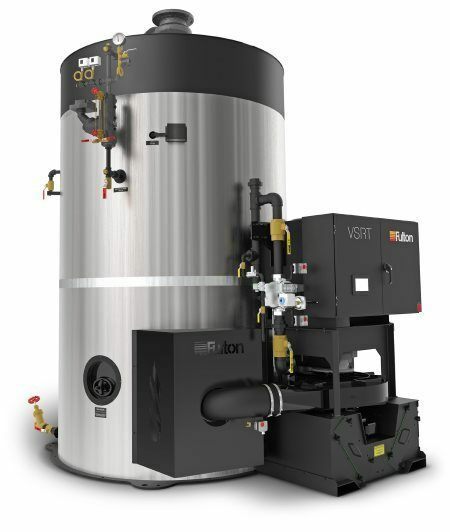 Request a free quote & consultation for the new Fulton VSRT 250 steam boiler. As the premier manufacturer's representative, Applied Technologies of New York offers Fulton's entire line of cutting-edge equipment. Our experienced sales engineers will carefully listen to your facility's needs and goals to guide you to the best boiler equipment. Let's take a closer look at the new Fulton VSRT 250 boiler. The VSRT 250 delivers industry-leading efficiencies with the ability to slash your facility's utility costs by as much as 20%. In addition, the VSRT 250 comes with a standard 20 ppm Low NOx high turndown burner. The highest thermal efficiency of 86% without the use of an economizer. The ability to deliver up to 99.75% verified steam quality with up to 3% system efficiency gain. The ability to achieve below .25% standby loss with up to 3% efficiency gain. Optimized VFD burner motor that delivers reduced electrical consumption and system precise load tracking. 9 ppm Low NOx burner optional without the use of flue gas recirculation. Up to 10:1 turndown with linkageless controls and O2 compensation, which provides anywhere from a 3% up to a 15% system gain in efficiency. The unique vertical boiler design works to reduce and minimize oxygen corrosion. An above average minimum ⅜" steel thickness, which helps to bolster the longevity of the equipment. You can trust Fulton's outstanding industry leadership with more than 100,000 industrial vertical steam boilers produced with the standard heavy-duty construction. The Fulton VSRT 250 boasts a self-compensating design that helps to eliminate thermal shock. The tolerant boiler design helps minimize water quality requirements and scaling issues. 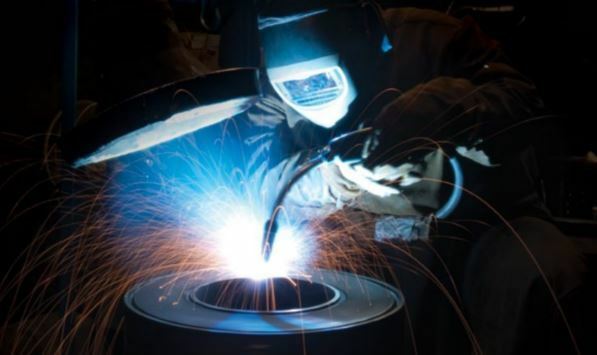 As a direct result of the craftsmanship and high-quality materials, Fulton stands behind their equipment with a 5-Year Burner Warranty and a 10-Year Pressure Vessel Warranty. A unique thermal shock-proof design to assist with fast startup. Optimized water volume quickly tracks alternating steam loads. Easy-to-use controls with built-in Lead/Lag functionality enhanced by an intuitive touchscreen interface. Minimal internal inspections and maintenance required. 14-inch Category I flue instead of the standard 20-inch flue, which is used throughout the industry. In addition, Fulton's Category I flue can be configurable with the top or side connection. The boiler can function at full capacity with only 13-inch wc gas pressure. Systems can be fine tuned to meet your building load requirements with modular solutions for Backup and Standby configurations. Looking to learn more about the Fulton VSRT 250? The experts at ATI of New York can help. Contact ATI of New York today to learn more about the benefits of the Fulton VSRT 250. 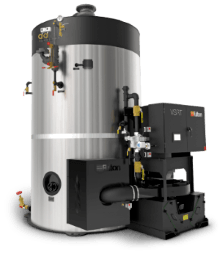 Fill out the form below to request a free Fulton VSRT 250 quote and consultation with the boiler & burner experts at Applied Technologies. Are Fulton Blow-Off Tanks the Best Way to Blow Off Steam? What Are Fulton Blowdown Separators?